5inch 4K Signal Support & Touch Screen 1920 x 1080 HDMI On-Camera LCD Field Monitor w/ Sony NP-F Battery Plates. Perfect for gimbal use and small setups. Comes with a Impressive 1080p resolution on a 5inch screen and having touch screen controls is a welcome bonus. Decent brightness of 450 NITS. This monitor ticks all the boxes! Long Arm helps photographer to control REC, FOCUS, ZOOM, TAKE PICTURE from the monitor directly. Long arm will be used together with LH5s monitor, The ideal, portable and lightweight video setup will be compatible with all brand of gimbal , stabilizer and others. It is one good setup for users on the go. 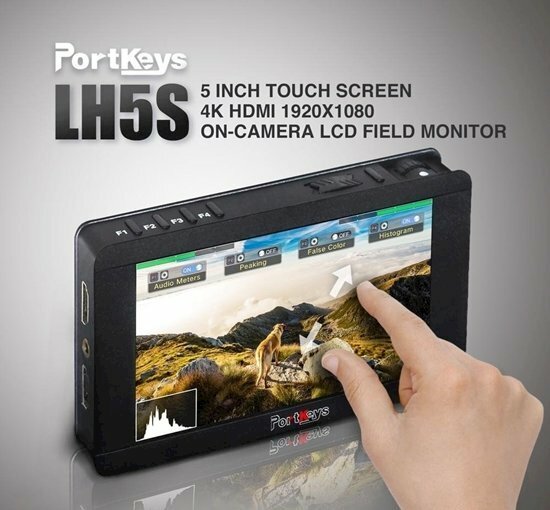 *LONG Arm is only Compatible with Portkeys LH5s Monitor. • Dimensions: 5.5 x 3.2 x 0.7 in. • Shipping Dimensions: 3 x 14.75 x 7.75 in.